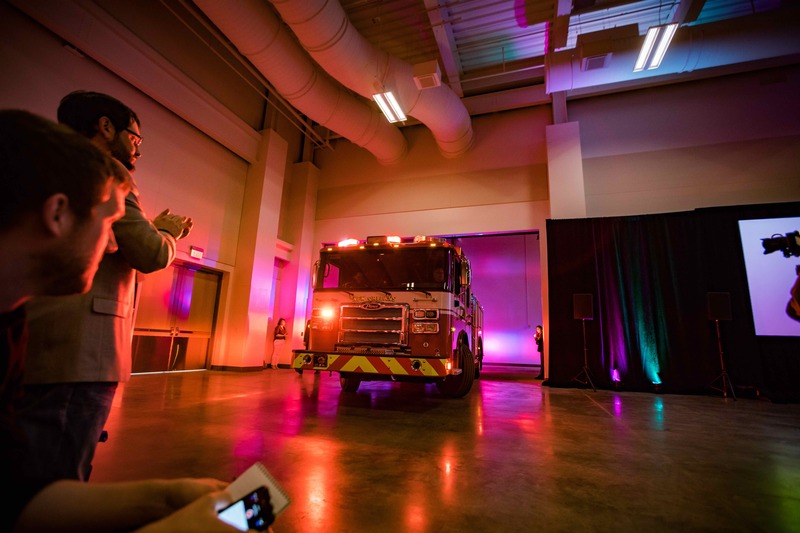 Governor Scott Walker opened the Governor’s Conference on Tourism on Monday morning, arriving in a Wisconsin-made firetruck. 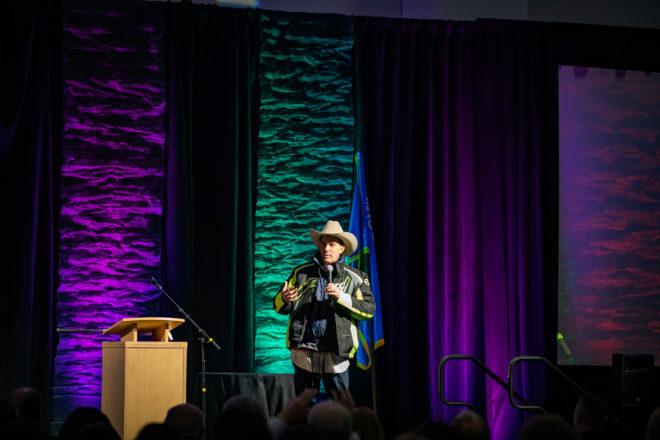 Governor Scott Walker arrived at Appleton’s new Fox Cities Exhibition Center in a Wisconsin-made fire truck, donning jackets representing industries that touch each part of the state, removing them one by one throughout his address to conference attendees. Walker touted the economic impact of tourism and its ability to create jobs in Wisconsin. “We’ve seen a $5.2 billion increase when it comes to economic impact in tourism,” Walker said. That increase has amounted to an additional 21,500 tourism-related jobs in the state, bringing the total to more than 193,454. Tourism is a $20 billion industry in Wisconsin. Walker joined Department of Tourism Secretary Stephanie Klett in opening the Governor’s Conference on Tourism. Klett recapped the prior year in Wisconsin tourism, including a successful marketing campaign in St. Louis, the creation and promotion of the Frank Lloyd Wright Trail and $143 million in earned media, or media coverage that the department did not have to pay advertising for. The conference serves as a way for local tourism promotion groups to get insight on the direction of the state’s marketing campaigns. Klett pushed the idea that Wisconsin is a fun place to visit, continuing last year’s theme. Survey results from a firm the department contracted with last year determined that potential visitors did not see Wisconsin as “a fun place for vacation” compared with other reasons for visiting the state. “Our brand is fun and we live it,” Klett said, introducing three commercials the department rolled out this year, including a spot featuring professional wheelchair basketball player and Olympic gold medalist Matt Scott, who attended University of Wisconsin-Whitewater and has returned to the state frequently ever since. Accessibility is a key theme for the department this year. In a recorded interview with Klett, Scott said many activities, such as accessing the beach of Whitefish Dunes State Park during his friend’s wedding last year, make the experience more enjoyable for both him and the people with him. Anyone who feels a bit of anxiety at the thought of your cellphone location and data being tracked might prefer to stay ignorant to a new data analytics firm the Department of Tourism is using to track the effect of media on tourism in the state. Arrivalist is a tech company that tracks the efficiency of media impressions by using geolocation data on visitors’ mobile devices. If you visit travelwisconsin.com or if you see one of their commercials pop up before a YouTube video, Arrivalist will track the location of your mobile device for the next six months. If they see your mobile device pop up in Wisconsin, then they know the advertising was probably effective. 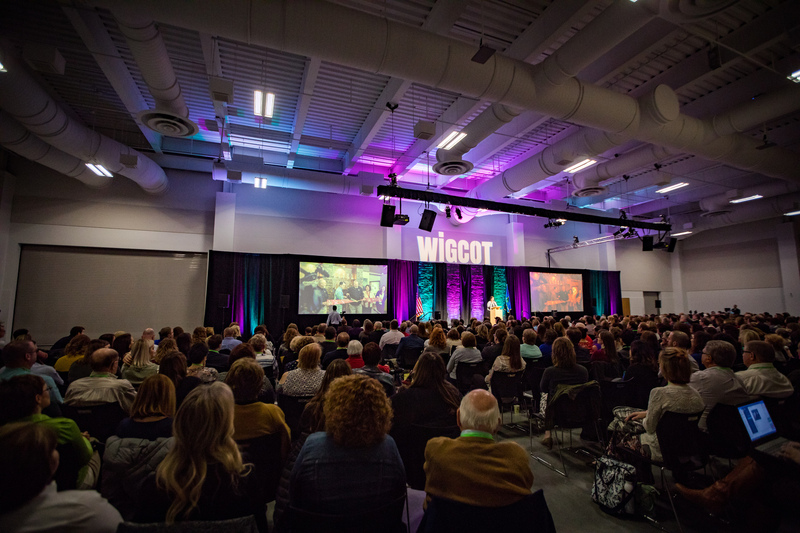 Approximately 900 people attended the Wisconsin Governor’s Conference on Tourism, held at the new Fox Cities Exhibition Center in Appleton. The company differentiates between paid media, or the advertisements the department pays for, owned media such as the department’s website and social media. Analysis of three of the Department of Tourism’s marketing campaigns in the past year details some obvious insights: summer is popular, Milwaukee and Madison get the most visitors and most people come from Illinois (47.1 percent for paid media). But other insights were not so obvious. Arrivals from people who simply visited the department’s website was highest in October, which department officials attributed to the fall color report. California and Florida were surprisingly big markets, especially for owned media impressions. Smith, who oversees data for many states, cities and events, said there were a few things that Wisconsin stood out on. In general, paid media was slightly more effective than it is in other states, which indicates good use of the marketing dollars that go toward purchasing ads. “This is a little bit higher on the paid media ratio than we typically see, that means your marketing dollars are efficient, you’re doing a good job,” Smith said. Smith also said growth of social media campaigns is more than he usually sees. Last year, social media drove 2.3 people to the state per one thousand people who saw social media posts. That number jumped to 2.9 people per thousand. Data showed visitors are spread sparsely throughout the state more than the norm, according to Smith. While he usually sees clusters packed more densely around the major metro areas of a state, people were attracted to all corners of Wisconsin. The technology excludes anyone within 50 miles of a location, assuming that if you have traveled 50 miles from home, you are visiting a new community. The service provided by Arrivalist isn’t cheap. One member of a tourism promotion group said the quote they got was more than $10,000 a month. But because the state tourism department has contracted the firm, Smith said they offer heavily discounted rates for entities within the state and can parse data down to a small area or a single event. 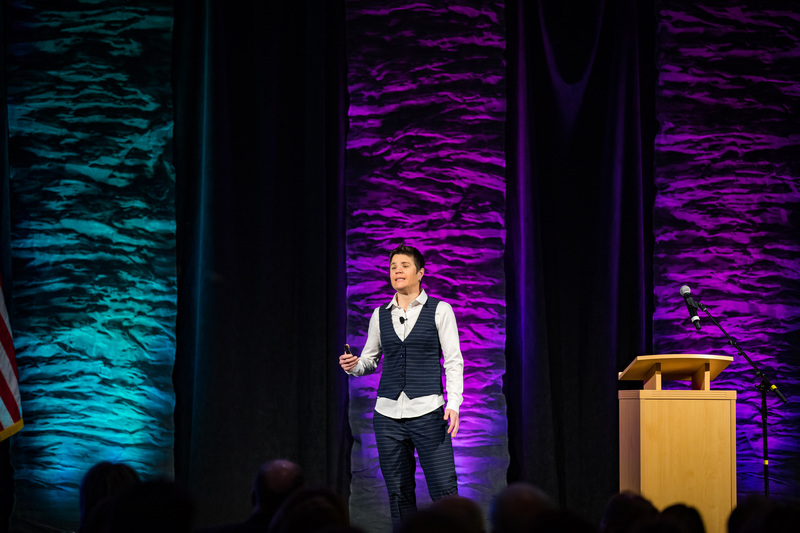 Elise Roy, advocate for accessibility, explained that designing for people with disabilities can unlock hidden benefits that improve the experience of all users. When Elise Roy began losing her hearing at the age of 10, it set in motion a career of advocating for accessibility. While there was the obvious benefit improved accessibility would have for people with disabilities, she found hidden benefits to accessible design that improved the experience for all users. Roy has worked with the United Nations on the International Disability Rights Treaty and founded an organization to help analyze problems from the perspective of people with disabilities. “Difference, even if it seems like a limitation, is what makes us thrive, what makes us valuable,” Roy said. She gave examples of tools originally made for people with disabilities that many people couldn’t imagine living without today, such as the remote control, audiobooks and typewriters. The Wisconsin Department of Tourism implemented an accessibility agenda this year by producing a commercial featuring University of Wisconsin-Whitewater graduate and wheelchair basketball star Matt Scott enjoying a number of activities around Milwaukee. Pam Seiler, executive director of the Sturgeon Bay Visitor Center, said the accessibility-centric agenda was a great idea because it opened up the state to new markets that weren’t targeted before. In Door County, there is no accessible design initiative as high profile as the reconstruction of Eagle Tower in Peninsula State Park. The Department of Natural Resources will rebuild the tower featuring a wheelchair accessible ramp to the top of the tower. Although the project likely doubled the cost to reconstruct the tower, DNR officials said the decision was made to promote the state park experience to all regardless of ability. In a breakout session with Roy, participants blindfolded themselves and walked around the halls of the conference center with someone who helped guide them. In discussing their experience, the group brainstormed ways in which the conference center could be easier to navigate for people with that disability. One tourism representative from Eau Claire found the exercise particularly helpful. Eau Claire will be host to the 2018 Beep Baseball World Series for blind baseball players. 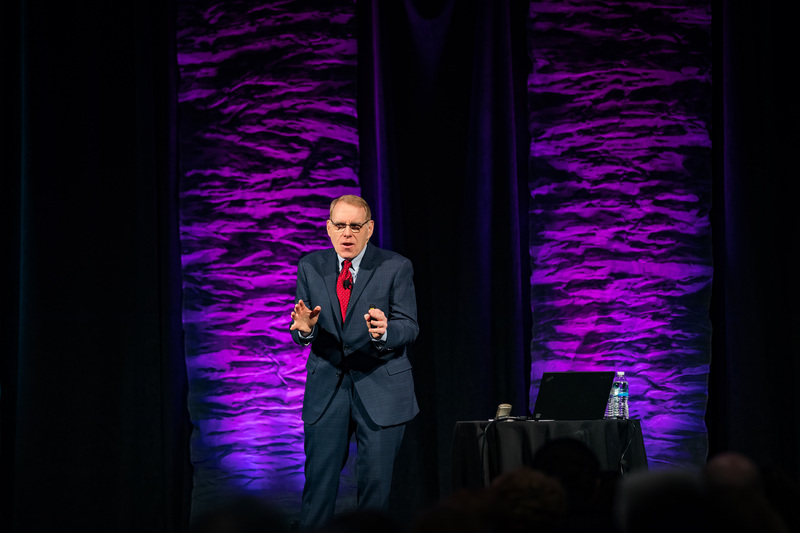 Joe Veneto, “The Opportunity Guy,” told attendees how to create truly unforgettable experiences that create lasting memories in visitors. Joe Veneto isn’t one for tours. He doesn’t want to just see the people, places and things in the destinations he visits, he wants to truly experience them. He would argue that visitors to Wisconsin are just like him. At the Dane County Farmers Market in Madison, Veneto is working with the city to offer walking tours with local chefs, who buy produce from the market and then take the group to the restaurant to cook with the food they just selected. Veneto helped a historic hotel in Paducah, Ky., shift from a simple tour to taking visitors back in time, complete with performances by Billie Holiday and Sam Cooke. While the retiring baby boomers are a target market for tourism, destinations are also clawing to attract a more elusive traveler: the millennial. Veneto has found three levels of experiences to offer visitors: show and tell, engage and immerse. The immersion experience should be the most sought after because they are the most likely to create lasting impressions on visitors. “The goal is to turn our customers into brand ambassadors,” Veneto said. He argues that destinations must actively engage visitors instead of simply preserving their community assets. Veneto is working with Madison, Eau Claire and the greater Green Bay area on developing more meaningful experiences for visitors.